The Poor Geek > Projects > Portable soldering options. Most of us have a soldering iron on our bench. Some of us even have nice, fully temperature-controlled ones (I grabbed a used Hakko FM-202 awhile back). When it comes to portable irons though, the options get far more limited. 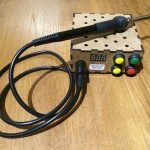 A quick search for “portable” or “cordless” soldering iron turns up a lot of seemingly workable solutions, from butane-powered irons to “cold” soldering irons that work via induction. Many scenarios make use of the butane irons dangerous, and the induction irons – according to multiple testimony from acquaintances in the maker community – just don’t work that well, or fail to work entirely. Here are a couple of alternatives that could make soldering on the go a lot more pleasant. 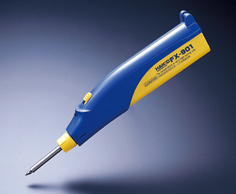 The Hakko FX-901. It’s a battery-powered (alkaline or NiMH) handheld soldering unit that boasts about an hour of effective (300ºC) runtime on 4 AA alkaline batteries, or up to two hours (with far more stable temperature) on 4 NiMH rechargeables. Replaceable tips in the typical Hakko style make it a pretty flexible unit. The unit itself is kind of unweildy however, with the battery compartment making up a rather bulky handle. I have one of these, but haven’t really had a chance to play with it yet, so I can’t make too many comments on real-world performance. 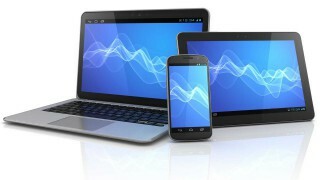 It’s not a wallet-buster at around $40 shipped from Amazon, and B+D Enterprises has the extra tips for a reasonable cost. Seriously don’t get the tips from Amazon, you’ll pay at least $10 more. The base unit includes the more expensive conical B-shape tip, so the D chisel tip is only an extra $13 or so from B+D. This one I discovered today when browsing hackaday.com. It’s a Hakko controller clone, with a boost regulator and LiPo battery attached – and can also run directly off a 12V supply, like your vehicle accessory outlet. The controller interface layout and case design was done by Xavier Werquin, and he’s done a magnificent job here. I’ve looked at these controller clone boards on eBay for awhile, mostly to make a small but low-cost workbench unit, but the fact that this works so well makes it worthy of mention. The boards are available for anywhere between $15 and $30 on eBay, and typically use the inexpensive Hakko 907 handle, which also supports replaceable tips. A simple search on eBay will net you a bunch of results, some which include the handle. If you watch the video on the project page, the iron doesn’t heat up anywhere nearly as fast as my FM-202 (which goes to operating temp in <10sec), but it does get up there pretty quickly. I don’t know if this is due to the controller, the battery, or the type of iron itself. Overall, this ends up a little pricier than the FX-901 above, but gives you workbench-class soldering capability in a package that’s fairly easy to carry around. I can’t wait to build one. Any other suggestions are more than welcome, as well as comments and discussion on the topic. Eventually we’ll re-open the forum for further discussions, but we’ve gotta figure out a good spam shield first.